The diameter of a circle is a line segment connecting the pair most remote from each other points of the circle passing through the center of the circle. The word "diameter" comes from the Greek word "diametros" - cross. Typically, the diameter is denoted by the Latin letter D or the icon Ø. The diameter can be found by the formula: D = 2R, where the diameter is twice the radius of the circle. The radius is the distance from the center to any point on the circle. 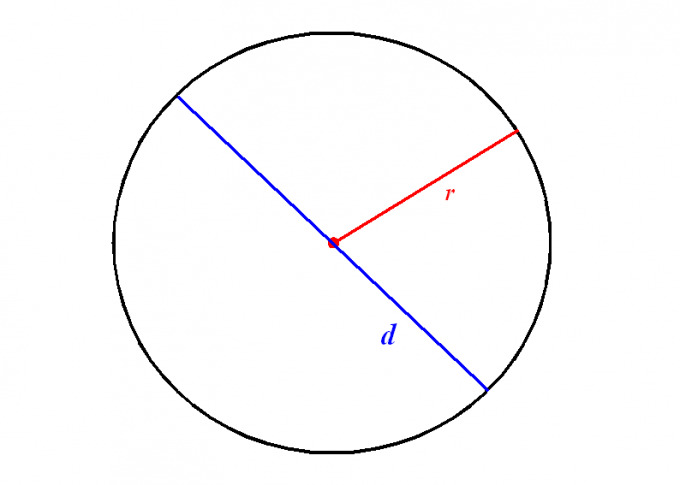 Denoted by R.
If you know the radius of the circle, for example, it is equal to 8 cm, then D = 2 * 8 = 16 cm. The second formula that you can find the diameter of a circle is: D = circumference divided by PI. The number PI is used in mathematics to denote a particular irrational number, and is approximately 3,14. So, very easy to find diameter of a circle. DIAMETER (from the Greek. diametros - diameter) of a circle is a line segment connecting two points of the circle and passing through its center. Diameter. DIAMETER, a, m. [it. Diameter < FR. diamètre < Greek. diametros diameter]. A straight line connecting the two points of the circle and passing through the center. D. circle. How to remember the emphasis in the word "cakes"
How to put the accent in the word "statue"
The stress position in the word "incandescent"
How to put the accent in the word "partner"